I am deeply interested in the intersection of art and design, and am always seeking opportunities to create meaning and improve communication through thoughtful, engaging graphics. I am also a cut-paper artist and illustrator. My subject matter is influenced by my love of biking and the outdoors. 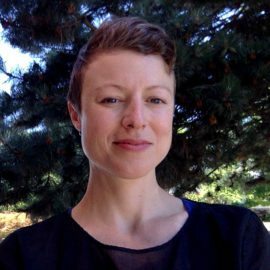 Elizabeth offers a range of experience, from working as a freelance draftsman, designer, and artist to teaching interior design at the Art Institute of Seattle. She earned her BFA from the School of the Art Institute of Chicago and received her MFAIA from Goddard College in 2017. Elizabeth has created branding, marketing, and packaging materials for clients ranging from small, locally-owned businesses to City Parks and Recreation agencies. She is an active volunteer with her hometown downtown association and recently completed a “Shop Local” campaign, for which she created original art, flyers and posters. Elizabeth draws on her expertise to provide highly professional graphic design for Alta projects, including final master planning and design reports and encouragement and education campaigns.